1. Cook noodles according to package directions; keep warm. 2. Meanwhile stack Beef steaks; cut lengthwise in half and then crosswise into 1"-wide strips. 3. In large nonstick skillet, heat 2 teaspoons oil over medium-high heat until hot. Add Beef and garlic (1/2 at a time) and stir-fry 1 minute or until outside surface of Beef is no longer pink. (Do not overcook.) Remove from skillet; season with 1/4 teaspoon salt and 1/4 teaspoon pepper. 4. In same skillet, cook mushrooms in remaining 2 teaspoons oil 2 minutes or until tender, stirring occasionally; remove from heat. Stir in gravy mix and 1 cup cold water; bring to a boil. Reduce heat to low; simmer 1 minute or until sauce is thickened, stirring frequently. Return Beef; heat through. 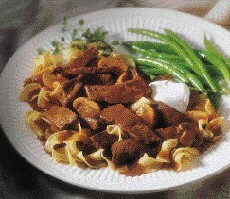 Serve over noodles with sour cream. 4 servings.